Facebook (FB - Get Report) continues to generate plenty of cash and be cheaply valued. Yet investors are unimpressed. So what's next for the giant social media company? The big move for Facebook over the near-term will be its inroads into e-commerce. Facebook will attempt different strategies, on its smaller platform, Instagram, at first, before fully rolling out this service on its family of platforms. Incidentally, if we learned anything from Carl Icahn's push to spin off PayPal (PYPL - Get Report) from Ebay (EBAY - Get Report) , it was that having a reliable, trustworthy payment system is extremely valuable. Similarly, Elliot's recent determination to unlock shareholder value in Ebay highlights to investors that not only is e-commerce outside of Amazon (AMZN - Get Report) still very much relevant, but that when executed well it can be very profitable. Consequently, Mark Zuckerberg noted to investors that commerce is going to be a very big focus for the company in the near-term as a way of helping consumers to discover new brands, an also expanding the power of influencers on its platforms. But making the transaction feel seamless and offering both parties a good experience is critical for Facebook, if it wishes to gain any market share in a very crowded market. Is the Market Fully Valued? We are trading in a very interesting period now, the longest bull market in history. 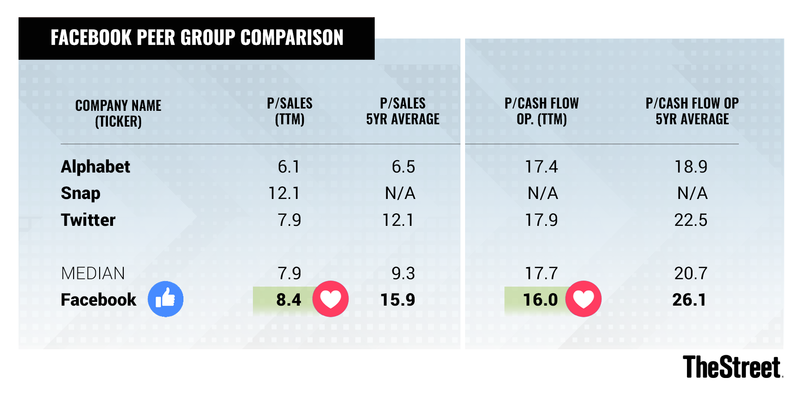 Stock market darlings like Netflix (NFLX - Get Report) (near-term revenue growth of mid 20s%), AMD (AMD - Get Report) (revenue growth of 9%) and Amazon (growing at mid-to-high 10s%) are amongst the companies whose sizable revenue growth is not translating into strong cash flow. And yet their share prices continue to leap ahead and show no signs of slowing. Many investors, including Warren Buffett, think the market is now fully priced. he whole premise of investing is that an asset is worth all its future cash flows discounted to the present, with an appropriate discount rate. And that at some point in time, a stock's value aligns with its intrinsic value. Facebook has no debt and $41 billion of cash and equivalents or 9% of its market cap is made up of cash, yet over the past 12 months the stock has not only trailed the Nasdaq, but has actually lost 6%. That raises the question of how the market can be fully valued when one of the FANGs has actually declined in the last year? In one sense, Alphabet (GOOGL - Get Report) is the most similar competitor to Facebook, given that both companies derive nearly all of their revenue from advertising. However, if you dig deeper, it becomes obvious that Facebook has an unmatched focus on profitability that no other company can even come close to. Alphabet is the envy of many companies around the world, with its operating margins consistently around mid 20s%. However, even during Facebook's troublesome 2019, Facebook is still guiding its operating expenses to jump by up to 45% to 50%, while at the same time, its revenue growth decelerates to approximately 25%. However, all in all, we are still likely to see Facebook's operating profit margins hover around 25% -- which equals Alphabet during its peak. In other words, Facebook in a bad year is about the same as Alphabet during its best years. While Facebook's revenue and expenses are expected to fall into alignment once we get into 2020, Facebook can realistically still say it expects to grow its top line by approximately 20% over the next several years. Taken together, this explains why Facebook has been so adamant about using the weakness in its share price to aggressively repurchase its shares. The company has deployed close to $13 billion over the past 12 months for share repurchases. Going forward, Facebook is much more than just a social media website -- it will be an increasingly entrenched conglomerate, offering its massive user base an endless array of value-added services. The company closed up 2.4% on Wednesday to $165.44. Facebook, Amazon and Alphabet are holdings in Jim Cramer's Action Alerts PLUS Charitable Trust Portfolio. Want to be alerted before Cramer buys or sells FB, PYPL or GOOGL? Learn more now. The author holds a position in Facebook.